As he and his team execute increasingly dangerous rescue missions inside the city, they face growing peril from a new enemy. Recently appointed Authority President Damien Gold claims to be guiding a city shaken by rebellion into a peaceful, harmonious future. But appearances can be deceiving. In order to achieve his dangerous ambitions, Gold knows he must do more than catch the rebels?he must destroy the hope their message represents ... from the inside out. With dissension in his own camp?and the CityWatch soldiers closing in?Remko feels control slipping through his fingers. To protect those he loves, he must conquer his fears and defeat Gold ... before one of them becomes his undoing. 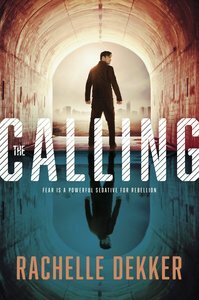 About "The Calling (#02 in A Seer Novel Series)"
Customer Reviews For "The Calling (#02 in A Seer Novel Series)"
What is freedom? Most people would say it is the ability to do as you choose; to live without rules. When Remko escaped the Authority City with Carrington Hale he thought he was choosing freedom from the Authority's rule. But he's beginning to feel that he has simply exchanged one prison for another. Authority President, Damien Gold, knows that as long as people believe in free will there will be rebellion against authority. But what if you eliminate the desire for choice? That's what he is working towards. He calls the project, "Genesis." A new beginning. The Calling opens right in on the action, with a highly emotional rescue attempt; one of several during the first half of the novel. Through it all we can see the increasing strain that Remko is under, the dissension that begins to eat away at the fabric of the Seers. There were times when I felt that the first half of this novel dragged a little, mainly because the action was couched in quite a bit of expository writing, but as the novel moved on I was bracing myself, anticipating the moment the tension would reach snapping point. I was permanently wide-eyed as I read the last quarter of the book and it was at that point that I found myself thinking "There's that Dekker brilliance I've come to know and love." I am eagerly anticipating the next novel in the series! Order now to secure your copy when our stock arrives. Other edition is available. 9781496402271 0 Available. Expected to ship in 6 to 7 weeks from Australia. Tactical leader of the Seers, Remko Brant is called on to undertake increasingly dangerous rescue missions inside the city. Recently appointed Authority President, Damien Gold is determined to undermine Remko and his group from within. As Gold's CityWatch closes in, Remko must protect those he loves.